The Cavs have an awful defense, numerous locker-room issues, tough competition and LeBron's free agency hanging over them. The Cleveland Cavaliers have endured dissension and dysfunction almost nonstop during the second LeBron James Era. In 2014-15, players grumbled about coach David Blatt. The following year, the team fired Blatt and replaced him with Ty Lue, who immediately faced questions about his authority. Last season, Kyrie Irving stewed over his role on the team and relationship with LeBron. All throughout, there have been subtweets, anonymous comments, and all kinds of other melodrama. Typically, things have worked out just fine. But this season is beginning to feel different. The Cavs are 27-18, and although they currently stand third in the Eastern Conference, they’re closer to seventh place than they are to second. 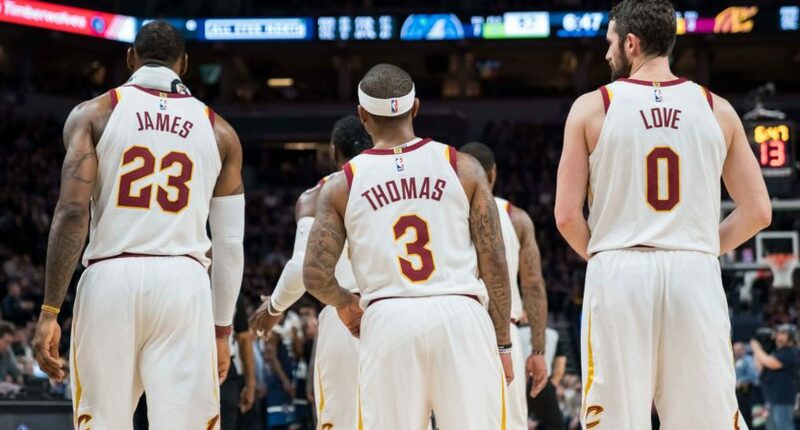 Last week, “multiple marquee Cleveland players” went to reporters to bash the team’s defense and particularly that of newly healthy point guard Isaiah Thomas. Then players reportedly held an intense meeting at which they criticized Kevin Love of exaggerating an injury. In the past, the Cavaliers have overcome whatever dysfunction they created for themselves through sheer talent and single-mindedness. They could bicker their way through the regular season, but come playoff time LeBron, Kyrie Irving, Love and crew were too much for the rest of the Eastern Conference to handle. The question now is whether the current Cleveland roster is good enough to thrive even amid chaos, and it’s not remotely clear that it is. After remaking much of their rotation over the offseason, the Cavs wound up with a mishmash of slowing veterans who offer offensive firepower but little defensive value. Thomas, Love, Dwyane Wade, Derrick Rose, Jae Crowder, and Kyle Korver are independently useful basketball players (to varying extents, of course), but they make little sense together. With numerous defensive sieves logging huge minutes and Love stuck playing center, the Cavs have the second-worst defense in the league. And although Cleveland will likely be active at the trade deadline, there’s only so much general manager Koby Altman can do. The Cavs won’t easily find the defensive stopper they need without sacrificing greatly to get it, and even one or two upgrades wouldn’t fully solve their defensive woes. Dealing Thomas and/or Love might ease some of the locker-room tension, but those stars won’t likely return full short-term value. Cleveland’s most valuable trade chip is Brooklyn’s 2018 draft pick, but the front office might hesitate to move that asset in the face of an uncertain future. The core of this roster probably won’t change substantially between now and April. Making matters worse for the Cavs, they could face legitimate opposition in the Eastern Conference playoffs. The Celtics have slowed since a hot start but are 34-13 nonetheless, with a well-rounded, well-coached squad that excels on defense. In Toronto, DeMar DeRozan is having a career year, while remarkable depth has helped the Raptors to the best point differential in the East. With the Cavs a little worse than usual and their competitors a little better than usual, Cleveland could face a legitimate challenge on the road to the NBA Finals. And of course lurking over all this is LeBron’s impending free agency, which adds an extra layer of urgency to each Cavs controversy. The Cavs desperately want to win a title this year before their star player (possibly) departs, but going all-in on this year seems increasingly futile with the Warriors cruising along out West. The secrecy surrounding LeBron’s future just makes every decision a bit more complicated and, presumably, every team meeting a bit more tense. Add all this together and you have a franchise in crisis, with problems on and off the court that make a happy ending difficult to foresee. Yes, the Cavs have swooned midseason before but never with such a long list of issues. In LeBron’s four years in Cleveland, a championship has never felt further away.